Ridge Vents: What Are They and Do You Need Them? Attic venting is an important part of the design of a home. During cold weather, attic ventilation can help to remove moisture from the attic space and to prevent ice dams from forming on the roof. During hot weather, attic ventilation serves to cool the attic, limit the buildup of moist air, and reduce the work that the air conditioning system must perform. Adequate ventilation in the attic can reduce energy costs while extending the life of the roof. There are several approaches to venting an attic, but one popular option is to use a ridge vent. What is a ridge vent? Do you need a ridge vent on your home? 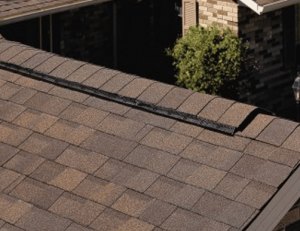 Here is what you need to know about ridge vents and attic ventilation. Ridge vents are a ventilation system that is installed along the peak of the roof. These low-profile vents allow air to be drawn from the attic space and vented to the outside. Ridge vents work best when used in conjunction with soffit vents that are installed underneath the roof, near where it meets the walls. Fresh air is drawn into the attic through the soffit vents, and passes along the roof sheathing on its way out through the ridge vents. Properly installed ridge vent systems provide a steady, consistent exchange of air throughout the attic space. This works to prevent moisture buildup in the attic, and thus extends the life of the roof while also helping to prevent the growth of mold. Ridge vents are a newer alternative compared to other options like gable vents and turbine vents, but they are growing in popularity because they work well. Roofing by Bruce makes it a point to stay current on the latest roofing news and information, including advancements in materials and installation techniques. Our services include new installations, inspections and repairs. Contact us today by calling 570-424-7250 to learn more or to request a quote.